Yes, it’s April. And yes, I’m just now posting my reading recap for March. Things have been more than a little hectic, and this blog has fallen by the wayside. But I’m getting my feet back under me–slowly but surely–and getting back into the groove. So without further preamble, here we go. 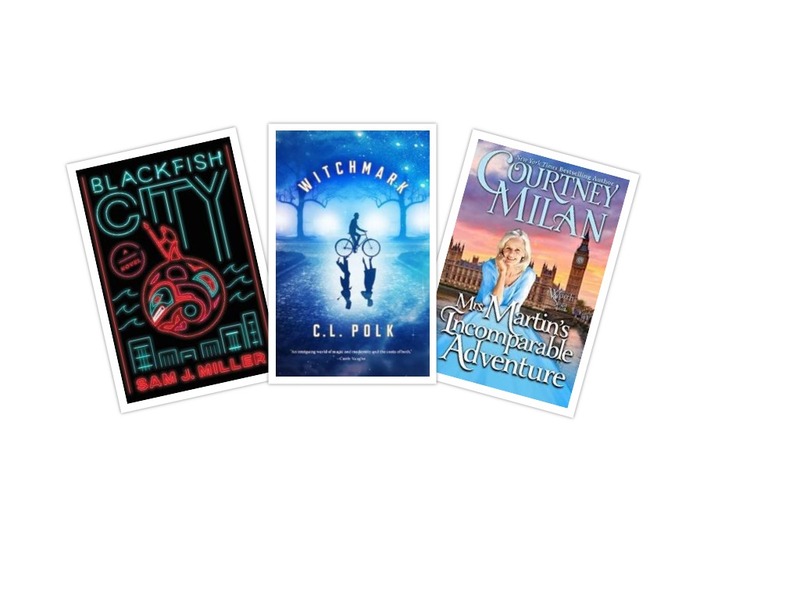 The first book of March was Blackfish City by Sam J. Miller. I’d seen hype about it on Twitter and bought the eBook when it went on sale. It’s set in the future with several science fiction elements (or maybe not because hey, it’s the future) after Earth has succumbed to climate change. The characters are engaging and worth reading about; however, the world building–while necessary–bogged me down. Next up was Witchmark by C.L. Polk, which I received from Tor Publishing’s as part of their monthly free eBook when you subscribe to their newsletter. As opposed to Blackfish City, this book built its world without being overwhelming. It draws on the general idea of Edwardian life after a World War. The characters are also fascinating; I’m seriously thinking about getting book 2 when it comes out. The final one was Mrs. Martin’s Incomparable Adventure by Courtney Milan. I picked up this novella ARC as part of the pre-release publicity. It’s a sweet, fluffy story about two elderly women making a middle-aged man (Mrs. Martin’s nephew) absolutely miserable. There’s enough conflict to move the story along without pushing it out of fluff territory. What did you read in March? Anything that I should check out?